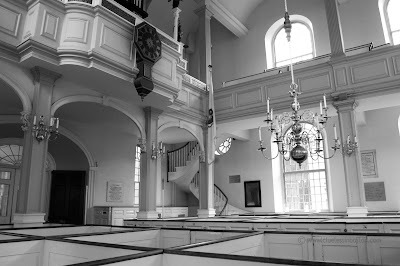 Another view of the interior of the Old North Church. That's a church??? That's very beautiful - as churches should be. Please forgive me if my visit to you blog in the next couple of weeks will be slightly intermittent, as I am home in Manila spending some lovely time with my closest and dearest, while basking in the sun. Your visits to my blog/s, however, are much appreciated! The staircase is wonderful. I'm wondering about the clock in the meeting house: I have never seen that! Very odd.